Although the books of clairvoyant André Groote were printed in Dutch some chapters were translated here by Carla de Kraker. André has written four Dutch books and Carla de Kraker translated several of his explanations concerning dreams. (Copyright © 2016 by André Groote) There are three books about dreams of people and the fourth is not published here since it contains his personal paranormal experiences in his life and he will not give it for free. The other books are online present in Dutch. André Groote feels he more is a paraphilosopher than a clairvoyant. He wants to explain the things that he sees. In his radioprogram “Met de muziek mee” music and interviews of invited guests like musicians and journalists. Wednesday 20.00 o' clock (Dutch time) streaming on the site www.vechtdalfm.nl he presents the program. 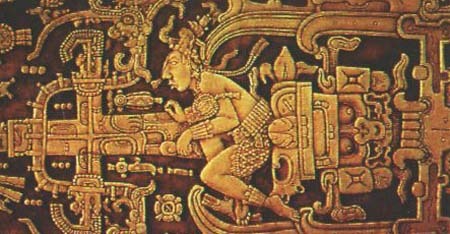 After the dreams we will discuss a fusion rocket from Atlantis based on his paranormal view, the image engraved on a stone cover of a Maya gravetomb and the S-1 Spheromak fusion machine of the Princeton Plasma Physics Laboratory. When I was very young I knew that I was paranormal gifted. When I saw a fire, there was a fire. When I saw somebody dead, somebody would die. That's how it starts with almost everybody. In most cases a real breakthrough with paranormal gifts goes along with an identity crisis. You go through a "desert period" of incredible loneliness. Lots of people however have at those turning points in life contact with the kind of things that are out of our daily world of experiences, and are scared to talk about it, scared to be made out as overstrained, a lunatic or something like that. In fact to the contrary, these facts are actually very normal, although we don't recognize them as such, let alone interpret them and work with them. Fortunately the vagueness and mysteriousness that surrounds the paranormal and everything involved is slowly disappearing. More and more books appear about the outer sensorial perceptiveness and people are hesitating less to come forward to share their experiences. Radio programs, articles in magazines and newspapers have contributed to this. Everybody is more or less paranormal gifted, whether your rich or poor, young or old. Paranormal is in fact very normal. I'm receiving more and more letters with questions, experiences and encounters with the paranormal, in other words "the normal life". In the first part of this book these experiences and encounters have been taken up in the daily life form. The letters are a selection out of hundreds that I've received and answered through the years. In the second part letters will be taken up with questions, experiences and encounters with dreams and leaving the body. Each chapter will be preceded by an introduction. The poems that accompany some of the chapters have been taken up by me, partially in my earlier days, and the others while composing this book. Finally in addition, we put down some striking words, in reaction to my answers. I hope that this book will contribute to more people stepping forward with their encounters and experiences so they can learn to recognize and make use of it in the rest of their life. Although André already had written this poem in 1986 in his Dutch book "Paranormaal belicht" he dedicated this poem to the 9-11 disaster. He predicted the disaster to some of his friends and clients one of them working in the Dutch brokery telling him something would happen with the World Trade Centre. The human being is only a part of the whole primeval age and because of that, he has only a limited knowledge of what's happening inside and around the sphere of him. It is a spiritual game of contact, sometimes a clear vision, and then again sometimes it's not more than a pinprick. If you were to blow up that pinprick to a total experience, a comprehensive message, then you make out of truth a small part which does injustice, in the first case to yourself but then again also to the spiritual competence of someone else, the material and immaterial human being. The total experience usually comes from the contact you have with the person that has passed on and whom you've loved or cared for a great deal. Those who have passed on seem to be very capable to give us messages, warnings or send us preventive energy, that will help us to gain consciousness. The contacts can appear through the following means: through sounds, apparition, dreams, visions etc. Sometimes someone has a guardian angel, which travels with her through life until certain maturity in a phase has been accomplished. The guardian angel can continue his own path, and if needed a new guardian angel will take over to take her to another level in life. A guardian angel doesn't necessarily have to be someone whom you've known in the material life. We don't control our visions, but they do. They decide about a yes- or no contact. Searching them is useless and hopeless; trying to find a needle in a haystack, unless that needle itself wants to be found. Then he appears and gives you that prick which you will recognize clearly as being him or her. With this I'm referring to the contacts which are made by mediums. I would like to point out that good contacts are a rarity. Most mediums are able to get clairvoyant images by having contact with the aura of the person sitting across from them, because remembering someone, whom you've loved or cared for can be found in ones aura. For a psychic there is no such thing as time, they should be able to see the person whom has passed on, especially those whom have meant a great deal to you. To make sure and check if the medium is genuine and honest, they should be able to tell you secrets, messages or experiences which you didn't know of and the person who passed on did and you should be able to verify that. This will always be difficult and give some uncertainty about this phenomenon. You won't know it until you are there, and even then it's difficult to prove the material, as you're not wearing your overcoat anymore. I would like to give you one more tip. Those whom have passed on want you to live among the living. When you live with them too much, that would mean that you are living in the immaterial world already, before your body has passed on. These last months, there are things happening which I cannot explain. One night as we got home the light in the shed was on. We were certain that when we left it was definitely turned off. Another time the thermostat was turned up to 25C and this while there was nobody at home and we never set the thermostat above 20-21C. Every now and then little things like that happen. When it happened to me the very first time, my reaction was: that's Phia, Joop (my husband's) little sister who passed on. We, the living in the material world, may never try to get contact with those whom have passed on. They will contact us, if they feel that it is important. Consciously raising somebody could be very dangerous, not only to you, but in the first place to those who've passed over. Take this for example: Somebody hasn't slept for a week and just lied down to rest for an hour getting over the emotions of it all. If you were to wake him up to ask him about the meaning of life, he would probably answer with get lost, leave me alone, I want to sleep I'm tired. So I would strongly suggest to you not to wake him. The fact that Phia wants to give you a message on her own accord is very clear to me and the solution is in fact very simple. Lately you've been busy in a much to superficial way. Material things seem to be going beyond spiritual matters. You tend to pass yourself by which could cost you your marriage. So what she's saying to you is: turn on the light, let your spiritual light shine, and let it shine warmth as you use to do as when you were a little girl. Hearty, warmth and love that is what she asks to give to you, and for her brother as well. Don't try to get contact with her to try to get the answer that you think fits, because you're trying to get around it, but try to admit openly to her and yourself that she is right. You already have your contact and the message that she is giving you is pretty clear. I'm 33 years old and married. My mother passed away eight years ago and my father one year ago. Now here is my problem. One morning at 06.30 I'm lying in bed just before waking up. My husband had just gone to work. Suddenly I feel something behind me, a sigh by my ear and saying: "Here I am". It scares me quite a bit and I sit up straight in my bed. I can feel there's someone here, but I'm not getting any answers. I am very frightened alone at home and I continue to sense as if someone wants to tell me something. The same thing happened to me last week again, but this time it was like someone was trying to pull the sheets and blankets over top of me. It said: "now we are coming to get you", and a strange thing happened as it felt as if I was sliding away towards my feet. Something stopped me and then I regained consciousness. You see this I find so strange and always puzzles me. You love someone and that person passes away. Then you get the evidence that dead is not actual death, but anew birth on the other side and then you're scared of it. What are you afraid of, for them or for yourself? I think for yourself, for when they were still alive, in this case your mother and father, they were the last ones you'd ever be frightened of. So let yourself go, you'll always return, since your time to pass over and to be born again on the other side won't be here for a very long time. They just want to show you that they are still there for you and that they are trying to help you with your problems in your present life. That sliding away which you've experienced is the starting of the outer body experience. So it's your astral body which withdraws from your material body and has the opportunity to experience the timelessness. Isn't it beautiful to meet someone of whom you think doesn't exist anymore. Suddenly you see that indeed they are there, even though they exist in another frequency. Don't let your husband laugh at you, or ridicule you, because his incomprehension invigorates your fear. Talk to someone who has more understanding for this, for instance your brother or sister, 'cause they were their father and mother as well. Further more the symbol "sigh" oxygen, necessary for life itself. At the same time it means the first breath of life on the other side. This sighing belongs to your mother, because not to long ago she suffered some oppression because of her heart. So you should feel safe and warm, for it's your own mother. I would like to give you one piece of advice. Go and consult a physician or a physiotherapist for some respiratory exercises, because while I'm answering your letter I get the same oppressive feeling and that is because of you, for you're not breathing right, and every now and then you're suffering from hyperventilation. Tension brings along a wrong kind of respiration, but of course you could also reverse it: by the right breathing technique you can get less tension (sigh). I have recently lost my mother. At night she was taken to the hospital. We, the children were alarmed. She had a cardiac infarct. The doctor told us that she was being monitored and calmed down. We could say goodbye to her and then we could go home. I went to bed, but couldn't catch my sleep. It was around 03.30 AM that I fell asleep to wake up half an hour later. In my sleep I heard a buzzing tone. It made me think of when a monitor stops. I wanted to wake up my husband to tell him that my mother was worsening condition. However I didn't, because I thought: no that can't be, because then they would have called us. I lied down again. Just as I lied down, the phone rang and we were called to the hospital, because my mothers condition was worsening. So when I heard that tone she had not passed away yet. Now I would like to know what the meaning of that was. Would my mother have thought of me strongly at that specific moment? We were very close. If one of us had any problems, we wouldn't tell each other, afraid to hurt each other. I miss her terrible. It will be pretty clear to you, and this I've written before, that clairvoyant abilities and telepathic contacts are the strongest with those whom you've loved most, in this case your mother. I am convinced that this was her who let you know. And not only that, you were with her too. The tone doesn't only mean that she wanted you to get there in time, but also meant preparing you for her passing on. For the fact that you've heard that you suddenly knew for sure that she was gonna die, and such an experience takes away some of the impact which you receive, when somebody you love so much passes away. This doesn't mean that you'll experience less sorrow, no definitely not, because you miss her overcoat to talk to directly or to be able to cuddle with her. Through an experience like this you get the evidence time after time again that there is more than the material world. The fact that there is life after death must be as clear as a whistle for you now, or maybe more credible for you than for someone that hasn't had this experience. It seems to me like a hopeless feeling if you don't have no faith at all in a life after death. I couldn't even imagine, because I'm so sure of it and so are you now, at least a little. In the future the dreams which you'll receive about your mother with have a different content as in predictions, which will help you and guide you in your daily life. Write them down, learn the symbolism, and they will be a great support to you. Supporting you is something she'll always keep on doing, because she's better at it now. There where she's at now, she's not being distracted anymore by her overcoat, which has been a burden to her for so long. I would like to learn some more about life after death. My father whom I was very close to, passed away last year on my birthday. I'm still very sad about it and I miss him a great deal. I've asked god to give me the strength to carry this heavy burden. I have read and heard a lot about paranormal gifts. Also some years ago I've heard a tape about spiritualism. The tape was about Godfried Bomans and voices from the hereafter. It left a great impression with me. That's why a lot of times I comfort myself with the thought: and is still with us. Now I would like to ask you if you could raise my father and ask him if he has something to tell us and if he wants to get in contact with me. This letter might sound a bit confusing, but I really hope to receive an answer from you if there's such a thing as life after death. More than ones I've experienced about life after death. I will give you an example. One night I had an out of body experience and met a man. I had never seen this man before. He asked me the following question: "Would you like to give a message to my wife and son Paul? Tell my wife to stop the lawsuit against the company I used to work for. My son has to make sure that he has all of my notebooks with the automatic writing in his possession. He has to hold on to them and in due time publish it." Then he walked away from me. I didn't know what to do with this message until I went to a birthday party a week later. Across from me there was a woman sitting, I didn't know. Suddenly I realized that the man I talked to indirectly was connected to her. I went through the crowd and sat down next to her, described the man to her and asked her if she knew him. She was astonished and said yes that she knew him. She said that this man and his family were acquaintances of them. She told me that this man passed away a few months ago, and the family was having serious problems. I told her the entire story. It was a great relieve to her, 'cause what I told her exactly fit the problems they were having at that time. The man had been a highly placed technical functionary for a big company. He had quite some inventions to his name for which he didn't get enough compensation. His wife wanted to start a legal procedure. He was very interested in the paranormal world and had notebooks full with automatic writing. The only son that showed any interest was Paul indeed. This woman passed the story on to the family. They were very happy with the message and acted accordingly. So you see Brigit, that after all these experiences (also with my own father) you have to believe in a life after death. Your father is most definitely with you and helping you too. How can you feel the sorrow from someone who's not really there anymore. Sorrow is the only possible reflection there is. Maybe this is a cold comfort, I know, but think about it. There's one more thing. When somebody dies and his body suffered immense pain, there is the aftereffect, to the immaterial body. You can help him with that. When you think of him think with love and send him the color blue. Don't ever try to raise someone. One of my sayings is if somebody wants to have contact with somebody in the material world they will do so on their own account and will have regained 100% consciousness again. We're only conscious for 15%. Part of that 100%, part of the layers that a human being possesses, will always be with those he or she loved. Fifteen years ago our son was killed in an accident. It's a miracle how I got through that period, even though at times I think about it. The evening before the accident we had just told him to always be careful. He said: "Mom, if I die I'll come crawling out of the ground anyway". He said this like he wanted to comfort us. The next morning a man came to the door and asked if P. lived here. I said yes, and he left without saying another word. I then got the presentiment as if something were to happen. Twenty minutes later our son was in an accident. A few days after the funeral when I went shopping I pulled out the plug of the gas-fire which our son was playing with every now and then. At that time there was nobody home. When I came back, there was a strange smell in the area of the socket, and the plug was plugged in again. I felt sort of a contact with my son. A few weeks after the funeral I had a dream that I was in a boat on the water. I arrived by a cave where there was a big party. On the stage was a long table, and there was a man with my son on his lap. I couldn't reach but called for him. He looked at me, laughed and said no. Generally children think about death very lightly. The only explanation is that children are closer to their past life than adults are. Time plays an important role in this. The closer you are to a happening the more tangible the memories are that you have of them. When it gets further away from you it's like a story of a vacation. If it was for more than 50% a lousy vacation, you tend to forget the nice things, and if it was for more than 50% a nice vacation you forget the bad things. That he said I'd come crawling out of the ground could mean that he remembered being buried in a previous life, even though he felt alive. He would have witnessed his own funeral. Thinking that way I will explain your dream and the man at the door. The man at the door, who asked if your son was at home, is the same man who held your son on his lap. The possibility is that he has become his new father in his next incarnation. In this case I strongly have to think about South-America, because I see this man with a fairly dark complexion. The cave with the stage could symbolize the womb in which he will be born on the other side after which he will return to earth as a living human being of flesh and blood. I find your experience beautiful and for you a piece of evidence of what he has said to you. There was more than one way, in which he had contact with you, so more than only pulling the plug out of the socket of the gas-fire. I hope that with this explanation you can help more people, because the way you got through this all should be an example to many more people. But you need to have enough energy for this. Pass on a little of this energy to others that are not as blessed with as much energy as you are. When my brother was seriously ill and finally died, I was being pursued by images which I noticed on the wall. As I sat at his sick-bed I noticed the images on the wall appearing to look like two kneeling down angels, each on a side of a table or coffin which had a cover over it. I thought: my brother is leaving us. Afterwards I saw an image radiating a bright light on the door of our house. I see that quite frequently. These images at a sickbed of someone who's dying appear quite often. I've experienced this several times. The images vary from person to person as they pass on to the other side. It all has to do with how he has lived, whom he has known, which believe he had and what his expectations (of heaven) were. The fact that you received those images after your brother was sick and died, has in time and space nothing to do with the moment you perceived this. It is something you register in your unconscious at the moment of the illness. As you know I don't believe in such thing as time. We made that to fit a clock in it. I can sense in your letter that the images which you've perceived, were inspired by the roman-catholic believe, therefor the two angels. They could have been two totally different people whom he has known in his own life, friends or family, those from the other side, whom help him understand that he or she returns to where he or she originated from: back to the world of eternity. The person you saw illuminated, was your own brother, who through the exchange of energy with the help of the angels was made aware that he had past on. If you would have seen a dark figure, that would have meant that the diseased person wouldn't have totally let go of his material body. Often you can see colors and energy around people. This doesn't mean that there are spirits standing next to a person, but you see the aura, the astral projection of the person whom it concerns with the memories attached in that aura, of people that have passed on already and of those that were really close to him or her. We call this aura information. Everything that a person has experienced in his or her life is visible for people that have a paranormal ability, for one more than another. It all depends on the spiritual development and feeling such a person has encountered through his or her life. Last year I was very depressed and I was fed up with everything, and I saw myself hanging on a rope. Those thoughts were so intense that it frightened me, just the thought that I would do such a thing. It was vicious circle just awful! I also saw flashes of someone hanging on a rope. I could only see the legs and feet. One afternoon I went to bed depressed and tired, but I couldn't sleep. Suddenly I witnessed an appearance in a frock, which didn't have a face and didn't have hands either. I was stunned, appalled, frightened everything at the same time. The next minute I witnessed a beautiful figure at my window, in a soft white light. The figure kneeled down, in a reprimanding way; at least that's how it felt with his hand towards his frock. I wasn't sleepy or groggy either. I experienced this in total consciousness. I think that besides being depressed, you also experience insensible hands. Sometimes it's as if they weren't there. I feel this strongly as I see you. I see a thirteenth century incarnation. In that time you were punished for something fatuous, because you know they use to do that in those days quite often. For stealing a pear your hands would be dismembered. And now you punish yourself without realizing it, for something that has nothing to do with the present, however with the past. I hope that after my explanation you will sigh deeply, will sleep in ease, and will keep on thinking: this depressed feeling doesn't belong to the present, but to the past. You know that if somebody in that time (thirteenth century) was to be hung a priest or monk would come along to the gallows. The monk who accompanied you said to you: "Keep looking at me and I will see to it that you calm down and get to heaven anyway, because I actually believe in your innocence." You were a man when you were hung. Your overcoat (your body) stayed behind and your spirit became conscious of your spirit dissociating from your body, with the help of the monk. Finally leaving the 13th century inquisition madness behind you. The monk traveled with you in time and space. He's still accompanying you. In a symbolic way, he is showing you things. The empty frock symbolizes the inanimate, the self-destruction, wanting to take your overcoat off, not seeing things straight anymore. The appearance at the window is the same monk, but as he is in his true form, all life and harmony, the actual spiritual being, just as you and I, which can be so radiating just as he is showing you now. Whatever happens, he is with you, so actually you are forcing yourself, and actually you are forcing your self, to renewed activities. You can think that you're happy, but you need more then just your activities in the house. Those other talents weren't given to you for no reason and the time has come to do something with those talents. If in three years you look back to the present time, you will know what I mean. The funny thing is that you don't have to go search for it, because it will come and knock upon your door. My father has passed on five years ago. A few weeks ago I was sitting in the living room watching television with my brother. My brother had fallen a sleep. I didn't notice it at first and just kept on watching television. When I suddenly looked at my brother, I saw my father standing next to him. I looked at him and he signed to me to be quiet. It seemed as if he wanted to tell me to not say anything. After this he pointed with his finger at my brother. Suddenly he disappeared. I wasn't scared at all after this happening, but could you possibly tell me what the meaning is of this? I am positive I didn't dream this, it truly happened. (I.S. from L.). I really believe that this actually happened, as I've experienced this many times. A few weeks ago I was visiting some acquaintances of mine that live in a rebuilt farmhouse. I said goodbye, walked out the backdoor and suddenly right next to me, I saw little baker sitting there completely dressed up in his entire outfit, even the cap wasn't missing. It was a very friendly man, and he seemed quite content as if he wanted to say: I'm enjoying myself. For the fact there are people living in my house or next door to me (I didn't know at the time) pleases me, as I've always loved birds and other animals, but didn't have too much time for them. That's what he said to me. I looked at him, and felt very comfortable. Then he suddenly disappeared. I asked the lady of the house if a baker used to live here, but she couldn't answer me. Seeing that I experience this quite often, I forgot about it. However a few weeks later I happened to visit them again, because the man of the house, a colleague magnetizer had a double herniated disk and was lying in bed. While we were drinking coffee his wife suddenly said: "Remember that little baker you asked me about, Andre?" I said, "yes", "Well", she said, "he used to live next door. I told the previous inhabitants of this house what you had seen and they replied that on our right side a baker use to live" (which would be exactly at the place where I came out of the door). For me those things are quite normal, that's why I believe you. For the fact that your father was standing next to your brother and didn't want for him to see, means that your father will stay at your brothers side for the time being, to help him. He is going through some hard times. It's a bit of coming and going with him. He hasn't quite found his way in life. For your father it was always very clear, and he will make sure and guide your brother on his path. I would like to advice him to be careful with his back; the best thing to do is to consult a manual therapist. At home we were with four girls and a boy. When my mother passed away in 1976, my sister and me were the only children in the hospital; my father, brother-in law and wife were there too. Now you need to know that the two of us weren't that popular, the other three were. At the time I was nineteen years old. When I was pregnant of my little boy, my mother appeared to me in the bedroom behind the door. My husband had midnight shift at the time. She nodded at me and asked me to come behind the door and stay with her forever. I told her that I couldn't, because I had to take care of my daughter. At the time she was six years old. My mother disappeared. But when I entered the living room, she was sitting on the couch. She had her hands folded, and was sitting there like a statue and didn't say anything anymore. Even when I turned on the lights, she didn't disappear. It was at daybreak when she left and I haven't seen her since. I have the feeling that she's still here at night. And now I'm scared in my bedroom at night and I can't sleep in the dark anymore, when I'm by myself. Even when my husband is at home, I can feel the ghost standing in my bedroom. I would like to know what this could mean. To be honest with you it scares me quite a bit. The fear for the death started for you when a male person in your family died. At the time you were seven years old. It was an older man. This man cared for you a lot. Ever since that time you've been scared, not for the death it self but because you had to miss someone whom on a emotional level gave you a lot of attention. At home you got less of this attention. You were kind of left on your own; at least that's how you experienced it. I think that feeling wasn't completely truthful, because when I see your mother, I see a woman who has been overstrained for years and had a lot of personal problems. Because of that, she experienced lots of difficulties raising a big family. You understand that when you are tired, everything is hard on you. After that there was a period in your life that you felt lonely and was quite overstrained. That was in the period when you were pregnant with your little boy .You had the feeling: how can I go on with this, there will be two children and I have so much more to do. There was no distraction at all, just the housekeeping. This was not a healthy situation. Then your mother suddenly appeared before you who asked you to come along with her. This wasn't a literally figure of speech, but it set you to a choice: staying with your family emotionally or getting more overstrained. The last thing didn't happen. You got better and you started enjoying life to the fullest again. Your mother helped you by doing that. So you can turn off the light at night and rest assured, because you sleep under the protection of someone whom you felt let you down before. For years my life has been accompanied with a tap. It's soft and gentle, and sounds as a fast timepiece. It is everywhere and it's movable. It's in the jar of jelly, a painting, a lamp, in the bookcase etc. It can be upstairs as well as down stairs. It has started about ten years ago. I was home one night by my self and was sitting at the table knitting, when I heard a tap over my head. I panicked a bit, because it kept on floating over me, even when I went into the hallway. I thought there was a watch lying around some where ticking, but couldn't find it. Walking around with that in mind for a few weeks I thought to myself: it must have been my imagination. One night it came back again and I told my husband. He was relieved, since he had heard it too. We checked everything, electric appliances, gas-stove, etc. There was nothing we could find that produced that ticking sound. We live in another house now, but the ticking moved along with us. It's all over again. My six children can hear it too. The youngest sixteen-year old girl is getting very restless and can't sleep anymore. Not to long ago we were sitting at the table talking, when suddenly we heard it in the flower vase. When we tapped against it, it would stop for a moment, to continue rapidly soon after. It is not in the furniture. We have renewed everything through the years. Could you possibly tell me what the watch ticking could be? (Mrs. G.N.B. from B). Yes what should you do with a tap like that? It's here; it's there. It's not in the furniture, in the lamp. Actually it has become quite familliair. You'd be surprised if it suddenly wouldn't be there anymore. I can even imagine smelling some cigar smoke or the scent of the fresh outside air. I see a landscape of the twentieths, quiet and serene, every now and then an old farmer's cart over the cobblestones. Then not to mention the beautiful old farm, not too big, but so cozy. A woman wearing a dark apron, busy cleaning the milk churns out. A cat is walking around her meowing. A dog is barking and the chickens are coming dangerously close. On the land a man is working with a drag. He knows there'll soon be a fresh piece of white bread with butter and cheese waiting for him. In the distance children are coming home from school, the boys in their oversized pants, one with a cap to small for his head and the other wearing one to big, but trading, no way, that only leads to quarrels. The girls, there are three of them, are walking around giggling, as in the early morning they wrote something on one of the boys backs with a piece of chalk. You will probably wonder what does all that have to do with us? Well, that is the images that I got by the ticking. I love it. I can watch this for hours. Unfortunately, it will never come back. What will come back, is a sound, the sound of an old -fashioned pocket watch which grandpa only wore on Sunday, and at special occasions. That tick is the tap in your home, and brings you home to the tranquility that you need so desperately in this hasty time. So be happy with this tap, since it belongs to your guardian-angel, "grandpa". Your answer was really striking. As a small child I often went to a small peaceful little town in Friesland, where my father's family use to live. I used to stay with Beppe. Pake died young and I barely knew him. When I stayed with Beppe I use to sleep cupboard-bed. I'd always have to climb in there, because it was too high. Then I'd drop myself on the bed and I would sink in the feathered mattress, with sheets that smelled like camphor and lavender. It was a true feast to visit Beppe's. She taught me to be patient, and to love. My mother told me that your description matched her exactly. She also told me that Pake had a golden pocket watch, a family heirloom. After Pake died, Beppe was supposed to give it to my father, but he refused to have it. Then my uncle got it in keeping, on the condition that it would be passed on to me if he were to die. My uncle passed away fifteen years ago, but the watch has not been returned yet. Myself, I have the idea that the tick has something to do with that. I do feel that the tap is sort of my guardian angel. It gave me comfort in hard times which I've experienced in the family as well with myself. About six weeks ago, it was a Sunday night, I was lying in my bed dozing off. Suddenly I heard footsteps. I looked up, and was looking from the bedroom into the hallway, but didn't see anything. Then for the second time I heard those footsteps. They were approaching my bed. The third time they approached my bed all the way and it seemed as if something wanted to grab or touch me. I totally went numb. My Husband was sleeping next to me. Normally I would have woken him up, because I was terrified. However I was frozen, couldn't do anything, not even when it disappeared. I told my mother and after a few days I forgot about it all, until now. At the moment my mother is staying here with me, because her boyfriend is in the hospital. She's sleeping in my daughter's bedroom. This morning she got out of bed quite upset. She experienced the same thing as I did then. She woke up by a murmuring noise. She opened her eyes and noticed a very big man standing next to her bed. He was broad, very dark complexion, very big eyes and enormous big hands. Suddenly he moves his hands underneath my mother's back and moved them twice from under her calves to her neck and back again. It was as if she was lifted up. She totally stiffened up, couldn't talk or move. Finally she saw him disappear through the window. She then got up, closed the window, got up and went to the bathroom. She was actually awake. According to her she wasn't a sleep and experienced this consciously. Maybe the explanation of your experience sounds very strange. However I will try to explain it to you as well as I can. The experience you've encountered has everything to do with your husband. What he unconsciously experienced in his sleep, you witnessed. Your husband was having a crisis at his work and with a lot of other things. He is a very introvert person. He has difficulties expressing himself and won't easily ask for help. However his subconscious cried out for help and send the message. And who appeared there: Uncle Herman. Uncle Herman used to be a close friend of the family in which your husband was raised. It wasn't a real uncle, but they all called him that. This man limped a little bit and every now and then walked with a cane. Your husband -Uncle Herman probably never showed it- was the apple of his eye. This spiritual bond, which your husband had with him even though he wasn't aware of it, also continued after his death. So he has actually become your husbands guardian angel. And when your husband was experiencing a difficult time, Uncle Herman came to help and guide him. That he has done this only proves the fact that your husband's crisis is over with. And what else does this mean? When your husband thinks back of the earlier days, he will come to the conclusion that this man always radiated a lot of peace and tranquility. When you'd be in his surrounding you would always feel at ease and when he was there you'd be quite comfortable. So apparently he had a magnetic gift. Actually your uncle has always been a paranormal gifted healer, and he proved that again by treating your mother that night. I'm happy you wrote this letter to me so that I could help solve a piece of the puzzle. However, there is no such thing as coincident. It had to go this way. The final message is that Uncle Herman is giving you a very clear message that your husband carries part of this gift in him and Uncle Herman will help him with that. Let your husband think about it and read some about it. I think that in the future he'll be able to help people himself. You should be happy with such a strong and conscious helper such as Uncle Herman on the other side. I am Hans Bergman, writer and researcher and will explain the image on the grave plate as a reminder of a fusionrocket from Atlantis. Nothing from the text or graphics shown on this site may be reproduced without the prior written consent of Hans Bergman and/or made public in any form or by any means. All texts, photos and other views on this website are copyrighted. The Publication1989fusionrocket15thSOFTUtrechtVol2.pdf.in Fusion Technology 1988, Proceedings of the 15th Symposium on Fusion Technology, Utrecht, the Netherlands, 19-23 September, 1988, Volume 2, A.M. Van Ingen, A. Nijsen-Vis, H.T. Klippel (editors) with the title "The Spheromak Fusion Machine as Propulsion in Spaceflight; Modification of the practical lightweight spheromak results in a fusionrocket for interplanetary spacetravel." published by Elsevier Science Publishers BV, copyright Hans Bergman © 1989, 2012. In the publication of 1989 you can still see my old address, but I moved to a new address. Sources of chapters 1, 2 and 3 in the publication: "Princeton Plasma Physics Laboratory Information Bulletins NT-2 November 1982" and "NT-3 March 1986" both about the S-1 Spheromak. Sources of chapters 4 and 5 are: research and discoveries of Hans Bergman and confirmations of Prof. Harry O. Ruppe and psychic André Groote. Confirmation of my proposed "mixed exhaust" by Prof. Dr. Harry O. Ruppe, Lehrstuhl für Raumfahrttechnik, Technische Universität München, Germany (NASA: Pioneer- Saturn- Skylab-projects -index-) and the formulas of propulsion (see publication) of Prof. Ruppe which support my idea of "mixed exhaust". Confirmation by psychic André Groote that the engraved cover stone of the pyramid Tomb in the room of the "Temple of Inscriptions" in Palenque, Mexico is a picture of a rocket with magnets in the bow and an explanation of the internal operation of the plasma. Psychic André Groote saw in the plasma "opposite rotating elliptically shaped electron currents that create opposite magnetic momentums. Finally the number of revolutions of the elliptically shaped electron currents determine the stability of the plasma." (see publication). "Scientists must work in the width, because untill now they have only worked in the height." My discipline (diploma1982) "Nuclear Engineering Technology": correspondence school Capitol Radio Engineering Institute, Delaware, USA. The FOM Institute for Plasma Physics Rijnhuizen has changed its name and is called FOM Institute for Fundamental Energy Research DIFFER or Dutch Institute for Fundamental Energy Research. In the beginning of my research in 1982 I worked with drawings of the fusionrocket and I assumed that the object in the plasma with the crescent cross-section (in the shape of a thick scale) was a "limiter". I had to use current available technolgy so I published it in 1988. In the mean time I have progressed with new plasma discoveries. According to the earlier understanding images of the plate (my first impression was that the crescent in the plasma was a limiter with the knowledge that was available and in my progressing opinion it could be a crescent hole in the plasma, an empty region instead of a thick scale in the plasma. A special region in the shape of a scale, more dense or empty, but special region. The drawing of the fusionrocket remains the same. however the limiter could be changed into a less dense or a more dense region in the plasma. The idea of a special region in the plasma came in 13-4-2012, when I realized that we learned from clairvoyant André Groote that there are opposite elliptically shaped electron currents (according to the Yin Yang-principle) so we allready know the final result of the opposite ellipsshaped electroncurrents in the plasma, but the scientist from Atlantis assumes that we don't know. In 2015 PPPL discovered something inside the MRX plasma which they said was a region with the shape of a saddle. This saddle however concerns 2 donuts coming together and not our plasma shape of a donut turning into a ball shape actually done for the stability. I think that the plasmaball is better for the stability since the heat and pressure added will have an effect. In an unstable plasma like a donut it will not have an effect. Add heat at the cost of pressure and opposite. Stabillity of the plasma is the key as I told the scientists at the conference in 1988. Even our sun which is a natural fusion reactor is a ball I said, only this is a small plasmaball. So the 2 objects inside the plasma like the stabilizer (or trigger) and the limiter could also be hints of plasma simulations concerning regions. So it could very well be possible that he or she (the engineer from Atlantis) wanted to give us a clue by creating a specific region in the plasma, which could belong to a special computersimulation of the plasma belonging to the configuration of the predicted opposite elliptically shaped electroncurrents (which according to the right number of revolutions will cause the appropriate opposite magnetic momentums to confine the plasma in perfect balance (according to the Yin-Yang principle(1)). Perhaps indeed a computersimulation of opposite ellipsshaped electroncurrents with the most recent recorded plasmabehaviour from the MRX-project, will show such specific region containing less or more dense plasma? The computersimulation will tell us wether or not the supposed special region exists. Shortly if (after the computersimulation) the special region does not exist we will fall back to the object idea and if the region exists my reasoning was just right. (1) André Groote said that the Yin-Yang principle can be found in the spiral galaxies. I once asked for a job at the PPPL after I published my paper, but mr. Cohen -I forgot his initials- rightfully said that I had no university grade and therefore did not have a high enough education and experience. However there is a paper from May 2015 A New Vision for Fusion Energy Research: Fusion Rockets for Planetary Defense where S. A. Cohen of PPPL promotes the use of a fusionrocket. Don't know if it is the same man. If it is the same man I am wondering if my experience from the Maya drawing showing a fusionrocket and the paranormal help I had on it was not in his field of experience, but if you have an explanation of a drawing of a fusionrocket in 1988, why writing much later in 2015 that you suddenly need a fusionrocket for planetary defense? Are universities controlled by the money funders in Washington? If yes, can they choose there own research and concentrate on available important data popping up from other experiences? Progressive scientists will do that, -like Harold Furth, PPPL, who was chief of the Spheromak research and who passed away in 2002-, they wil study everything, but conservative scientists will not, they don't want to rise, but want to stay low at the surface. In this article from PPPL from the current chief Yamada, MRX, PPPL about the offspring from the Spheromak research leading towards the MRX research, it sounds that in 1988 the Spheromak research was declared dead. However in 1988 it was only beginning. I always wondered what will the scientists of PPPL say if they are confronted with my readers on the internet during all those years concerning my Palenkomak fusion rocket? The answer will be, I cite from the PPPL article: "It was a simple idea for a reactor — a machine with simple geometry — but the confinement properties weren't good," Yamada said. In other words, S-1 was unable to keep the plasma within its magnetic borders. In addition, the entire plasma mass tended to tilt, becoming unstable. After several years of intensive research, the device was shut down in 1988. In 1988 I published the fusionrocket at the SOFT in Nieuwegein, the Netherlands. The modification of the Spheromak to move the plasma to one side into a more stable sphere that I proposed in my published paper was neglected. White Bear Fredericks advised me somewhere between 1974 and 1979 to look inside myself to find an answer, which I did much later in 2012. At 03-26-2012 I was relaxing in the sun with a gentle breeze in the garden and I was thinking about the text of the songs from André Groote, poems about the wind telling what once happened in the distant past. I also thought about White Bear Fredericks. I thought, let me for once also experience this concerning the fusionrocket of which I just intensively had been working on in writing, and I felt the sensation of the wind touching my skin and saw a sheath of red plastic (a dome shape lying on its side with the edge at the left side). It looked like a plastic dome of a small red alarm light, but the light was not on. Then I saw the back of the fusionrocket with the circular outlet in full action. From the whole circular surface bright white spokes -small (in hight) conical and pointing outward- (3) came out with here and there a little longer tapered spoke of blazing white compact exhaust particles, coming from the rocket engine over the entire surface of the circle and it was a beautiful sight to see that working fusionrocket. After seeing this vision I looked again at the outlet of the fusionrocket on the graveplate, where the exhaust almost equally is divided into small parts or protrusions of exhaust, more realizing that it belongs especially to the exhaust of a fusionrocket. This again was a result of the guidingtubes (probably with coils in it) in the first outlet and after the liquid fuel injection in the second outlet a mixed exhaust of short and sharp burning white bright conical spokes of exhaust material will be expelled. In the vision the back of the rocket was up in a tilted position (upwards less than approximately 28 degrees tilted to the right and tilted away from me) and I saw the full back as a circular burning outlet full with almost perfect white bright burning spokes. More information about the fusionrocket can be found at www.fusionrocket.nl. Seeing aura's https://www.sciencedaily.com/releases/2012/05/120504110024.htm in a scientific view.